At Matimoo we are excited to announce new changes to our packaging design. Originally, the insert card which sits within the inside of the package wrote “A Collection Enriched with Protection”. Which paid homage to the routes of our brand being based upon sending good vibes. “Customizing your Matimoo bracelet to your desired wrist size is easy. Use knots as anchors when adjusting. Pulling back on knots = Expanding. Pulling Forward on knots = Contracting. For further details please visit http://matimoo.com/one-size-fits-all to view our video demonstration”. At Matimoo our main goal is to make sure that we continue to elevate and evolve our brand. A key component to our growth has been the constant feedback in which we receive from our loyal fan base. We appreciate all the feedback and please note that we will continue to work hard on the behalf of all the loyal fans that have believed in our brand since day one! Matimoo is excited to announce that we have added four new variations to our collection. Due to popular demand we have added two new shades of pink along with two vibrant new eye colors. As explained in previous blog posts the meanings behind each color are symbolic and special in a variety of ways. Turquoise brings stability to our lives, therefore we decided to add that as one of our newest eye colors. Additionally pink stands for caring, compassion, and love. These exciting new color combinations not only add style to your wrist, but add an extra layer of protection to your everyday life. This fall keep an eye out for more eye popping colors! It is always exciting for me to attend art festivals and connect with Matimoo fans at these local events. Last week, we headed out to Jersey City for the local art festival known as “Artist and Maker Market”. Despite being a gloomy humid day (dog days of summer), I was able to gather intrigue from those who may have never heard of Matimoo before. Jersey City had a great vibe for not only fans of local craft, but for the artist themselves. Being right near the PATH station was a bit different compared to the other art festival we had visited before. Plenty of commuters coming back and forth from the city were able to witness the various local artist from the area. The unrelenting rain may have dampened the day, but the food, music, and artisans made up for it. It was quite amazing to see the various kinds of artisans and makers that attended this event. Not only did they bring their craftsmanship to the event, but their unique ideas as well. Yet again, I cannot say this enough, our fans loyalty to Matimoo is what makes coming out to these events a rewarding experience. Due in part to being a Wednesday, the crowd in the beginning was not as large as I anticipated. However, as the night went on, more and more people eagerly came up to our booth. I met a couple who had never encountered our brand before, but I enthusiastically introduced them to Matimoo. Once I had informed them about how Matimoo brings good luck and wards off evil (good vibes) their facial expressions quickly changed from inquisitive to interested. They wholeheartedly decided to purchase a bunch of our bracelets. With a positive message as our core belief, it is no wonder why people take so fast to our brand. This was a big spring for Matimoo! We were featured in (201) Gold Coast Magazine not once but twice this season and are elated to express our deep appreciation and gratitude for being recognized by a leading publication. Gold Coast is the new go to magazine for the North Jersey community, and serves as a solid platform for Matimoo to expand our brand awareness across our home state. Articles of this nature help tell the story behind the brand and how it continues to evolve since our initial launch in Spring 2015. “I personally loved how the article mentioned that wearing a Matimoo wards off evil and brings good luck.” Which is what our brand is all about good-luck & good-vibes. These are the moments, that make my job entirely memorable and rewarding. At Matimoo we celebrate each accolade and milestone and recognize that it’s all of our loyal fans that keep fueling our fire. We would love to extend a thanks to everyone at (201) Gold Coast involved in providing coverage of our brand. We are enthusiastic that this will provide great momentum for the year ahead. This past spring we have served many customers as a result of our editorial coverage. The readers that spotted our brand in (201) were all locals that wanted to support a local brand. As a result there are a significant amount of new Matimoo fans along the Gold Coast. This past Sunday was truly a day long celebration of the arts at Braddock Park in North Bergen. (minus the never ending gusts of wind) It was the second annual time that the Braddock Park Art festival was held, featuring many local artist who displayed their talents and creativity. Not only was it exciting to meet many of the local artisans in the community, but also encountering the people who have a love for hand-made arts was splendid. Thanks in part to the people who crave craft jewelry, you made Matimoo’s appearance a success. The unwavering support shown by our customers is what we love and appreciate here at Matimoo. I also want to take a moment to thank all of my friends who came out and supported me during the event and also volunteered their time throughout the day. Looking back upon this weekend, it truly made me realize how much I enjoy showcasing Matimoo at these venues. Meeting with the people who adore our bracelets is what makes Matimoo a rewarding journey. Matimoo Spotting At JFK Airport! Sometimes in life you find surprises in the most unexpected of places. This past April I was at JFK waiting to board a flight to LAX. The airport was packed the flight was overbooked and I of course was on a conference call with bad cell phone service. When all of a sudden, I look up and spot a wrist full of Matimoo bracelets! Immediately I wanted to drop my phone and run up to the girl to ask her where she purchased them and if she liked them? Well unfortunately that wasn’t possible, I couldn’t drop my phone nor was I going to tackle this young lady. So fast forward to 20 minutes later when I am boarding the flight after my ticket was scanned, I proceeded down the gateway where there was another attendant who asked me if I was going to LAX or San Francisco. At that moment, I had realized it was the same girl I had spotted minutes earlier. I quickly asked her where she got her bracelets and she promptly replied Amazon! I then asked if she liked them, hoping that the answer would be yes! She did not just like them she loved them. To my excitement, she told me that she had ordered them for her entire family. I then showed her my wrist and explained that I was the founder of the brand and that seeing her wrist absolutely made my day! I did not board the flight until I snapped a picture of her wrist and gave her my card. She followed up with me by email while I was in flight and when I returned home I sent her a couple of goodies to remember me by! Ivi, it was great meeting you and Matimoo appreciates your unwavering support! In March we celebrated our one year anniversary as a brand and as the Creative Director, I can attest to the fact that this has been quite a journey and a labor of love. When starting Matimoo, I wasn’t quite sure what to expect but one year later I can tell you that it has been one of the most fulfilling projects while quite possibly one of the hardest. If you followed us from the beginning we launched our core bracelet in four color ways and began promoting it via social media channels the main one being Instagram. With the help of some amazing friends along the way word began to spread around the local tri-state area and then soon after orders began coming from across the country and even Canada. It was the beginning of an exciting year, in late spring 2015 we launched more color combinations and since then we have continued to evolve the collection up til this day. Over the course of the past year we have sponsored and participated in several events across the tri-state area ranging from Charity events, women’s shopping events, and even street fairs. Each one of these venues have been extremely unique and have played a major role in growing our presence as a brand. Within the first couple of months we were fortunate enough to gain acceptance into small boutiques across the NY/NJ area and even became a popular trending brand in various Facebook groups. With a longtime career in the fashion industry I had enlisted close friends and even past colleagues to assist in my mission to spread the word. My vision has been and remains to keep my brand as an affordable, asprirational, and attainable collection for all ages. These are the components that continue to drive Matimoo and will remain in place as our core principles as we continue to grow one step at a time. In one years time we have sold roughly 6,000 bracelets and a lot of work has gone into ensuring that our customers are fully satisfied. My goal isn’t for Matimoo to be a one hit wonder but a brand that sustains and continues to build momentum over the course of time. It is for that reason that I choose to grow my brand at a more strategic pace in an effort to ensure that each facet of the Matimoo brand is never compromised. Initially as I began receiving orders I could handle the amount on my own. The most time consuming part of Matimoo is that we inspect each bracelet prior to shipping, therefore the process is extremely time consuming. Back in October I realized I could no longer do it on my own, while managing the other aspects of the business especially leading into the holiday season. Stressed out and overwhelmed I decided to post an ad on Craigslist and the next step of building Matimoo began. As I built a team comprised of part timers who helped inspect, tighten, and adjust each bracelet to meet my set standards of quality control. I knew that the next phase of Matimoo was well under way. Having been in the industry for a long time and watching brands struggle as a result of quality issues. This made me extremely attentive and possibly obsessive with ensuring that I was managing this part of my business seamlessly. If someone had ever told me that a bracelet on a wax cord which is also fully adjustable would be so complex, I would have never been able to wrap my head around it. Well fast forward to 2016 and I can tell you that there is a lot more to this little bracelet than meets the eye. I learned a lot about myself this year and my ability to wear several different hats while juggling a million tasks. I had always worked for major corporations and along with that came stability and structure so starting my own business didn’t necessarily provide any of that. However, I created my own structure and incorporated the same skills that made me successful in my previous roles to building my own business. The only difference this time around is that the only person I answer to is myself at the end of each day. One of the most valuable lessons I’ve learned this year is just how amazing my friends are and how I am so grateful to everyone for their unwavering support throughout my journey. During my peak season several of my closest friends (You all know who you are) came to my office to help tighten and adjust bracelets so that I could fulfill all of my orders. Additionally so many of my nearest and dearest have posted on social media, have promoted Matimoo to local stores, and in some cases on days where we had multiple events scheduled they helped me out by running an event. I believe that life is full of many lessons and sometimes you learn more than you anticipate, I began building Matimoo on a quest to expand my horizons while utilizing my background as my foundation. As I mentioned earlier, I have indeed learned a lot about myself and my inner strength. However, I think above all else, I learned a lot more about the people around me and just how fortunate I am to be blessed with such an amazing group of friends. As we continue forward to our second year, the lesson I would love to pass on to any reader is how important surrounding yourself with positive energy will undoubtedly produce a positive outcome in your life. Thank you for your support & keep looking for new Mati-moments. Conceive it, Believe it, and you will Achieve it! Running an Online Business Requires Having The Right Webhosting Provider ! On Sunday, February 7th, Team Matimoo was truly honored to be a vendor at the Glam Bazaar in NYC in support of the Ilona Melyokhin Memory Fund which is raising money and awareness to those who struggle with eating disorders. The Ilona Memory Fund’s mission is to secure funding that will prevent and treat eating disorders, including anorexia and bulimia through education, public policy change and community support. For more information about the charity or to make a contribution, please visit http://www.ilonamemoryfund.com/ The afternoon was filled with food, drinks, shopping, motivational speakers and fun for a great cause!! Team Matimoo had the best time meeting new customers and making new friends! We were also so excited to release our NEW hamsa bracelet at the Glam Bazaar and were elated by the tremendous reception the new design received. Check out some of the fab photos here and on our Instagram page @matimoocollections. The fundraiser was a huge success and we still made it in time for the half time Super Bowl show!! The meaning of the evil eye is widely known as an amulet to ward off evil and negative energy. Our Matimoo bracelet comes in various colors which also has meaning. So many of you have been curious about color meanings so we did a little research and here is what we found!! ORANGE – energy, balance, warmth and enthusiasm. What color is on your wrist?!?!? Follow us on Facebook and Instagram @matimoocollections for fab new colors launching soon!! We have more exciting new colors and designs in production for the weeks to come which we cannot wait to share with our loyal fans!! Stay tuned to our Facebook, Instagram and Twitter pages to keep up with our latest and greatest! Reflecting On Our First Year And Looking Forward To Whats Ahead! Happy New Year!! It is with great appreciation that we say many thanks to our fans and supporters for making 2015 an amazing first year for us! We are so grateful a nd humbled by the tremendous support Matimoo has received. Less than 9 months ago we had only 2 colors of our core style in production and today we have 11 fun colors in our collection. None of this would be possible without our loyal customers! THANK YOU!!! Stay tuned and follow us on Instagram @matimoocollections for fabulous new styles, designs and colors COMING SOON to add to your arm stack!!! Wishing everyone happiness, health, luck and good fortune in 2016!! What color matimoo will be on your wrist this NYE?!?! December 13th, Team Matimoo was a vendor at the Glitz Holiday Shopping Extravaganza at the Downhouse Lounge in Brooklyn! This event is part of many glitzy fab affairs hosted by e2e events! We arrived promptly at 11am and setup our table for the kick-off of shop ping at 1pm! We had the best time meeting new customers, seeing loyal Matimoo fans and making friends with fellow vendors! Our illuminating table had tons of continuous traffic throughout the afternoon! We truly have the best supporters!! It was a terrific (and exhausting) day! Thank you thank you – none of our success this past year would be possi ble without you!! The shopping event concluded with a beautiful lighting of the menorah to commemorate the last night of Hanukkah and of course yummy doughnuts!!! Sadly, our diet went out the window with the doughnuts!! Well, tis the season for treats – diets starts up again in the New Year! This fall has been an especially exciting time for Matimoo. We recently launched our newest colors Purple, Orange, Hunter Green, & True Yellow all of which have been well received by our customers. The Fall launch required a lot of preparation and narrowing down the right colors and f abrications were a key component in doing so. It definitely took me some time to come up with the right color palette in order to pull the story together for our first Fall season. My inspiration for this season was to create a color story comprised of rich jewel tones and after playing with several ideas I landed on warm colors combined with a splash of festive fun. As I continue to grow our assortment each season several factors come into play the most important being upholding our quality through seeking the finest quality of materials. In A Little Under A Year! How Far We Have Come! It’s hard to believe we are only 9 months old! When I began Matimoo earlier in the year it was a small side project comprised of one silhouette being made in one color which was “Black” fast forward to today and we now offer our core bracelet in 11 different color ways. We have expanded our online selling network along with our retail partnerships. I couldn’t be anymore grateful for how far my brand has come and truly appreciate all the support we have received throughout the course of the year. Robin’s Racers Vendor Event East Meadow NY, 10/4 Raising money for the American Cancer Society. On October 4th we ventured off to Long Island in support of Robin’s Racers Vendor Event. Robin is a Breast Cancer survivor and orchestrated an amazing event for the cause. The event which was held at the East Meadow Jewish center had a wide variety of vendors along with a plethora of raffle prizes and swag to accompany it. For our part Matimoo contributed 250 bracelets for the swag bags which were handed out to the first 250 attendees of the event. We truly appreciated the opportunity to partake in such a special event and hope to be able to return next year as a sponsor. As the quest for a cure continues each year more and more strides against Breast Cancer are made through large outreach and events in support of the cause. Matimoo Pink/ with a Crocheted Breast Cancer Ribbon handmade by an event supporter. Sunday August 30th Matimoo participated at the Brighton Jubilee, which is one of the largest annual street fairs in Brooklyn N.Y. The Jubilee takes place in the Brighton Beach section of Brooklyn which is home to a large Ukrainian & Russian Community. With the famous boardwalk a mere one block away, several fair-goers were eating,shopping, and then soaking up the sun. Several of the busiest local streets were closed off to accommodate the large crowds of up to 500,000 people. The best part of the day was meeting some of our loyal Matimoo fans! We were absolutely elated to see so many people wearing their Matimoo bracelets. We truly appreciated the warm welcoming we received at the Jubilee! Check out the photo below which features one of our customers who had already purchased a Matimoo bracelet and when she saw our table stopped and added a few more to her collection! There are several components in the manufacturing process of each Matimoo bracelet. One primary step is the selection of the perfect “EvilEye” bead! We work diligently to ensure that each bead meets our quality and aesthetic standards while still bringing individuality and character to each finished piece. You might see variations between the eyes and that’s ok! Each eye is meant to have a bit of its own identity. 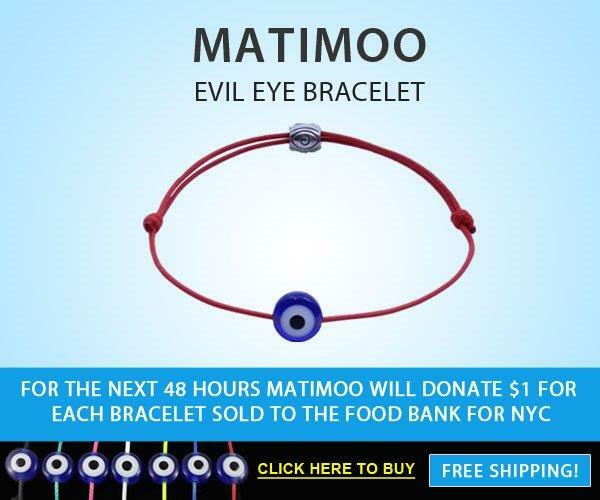 Matimoo Launches Campaign Featured in Brooklyn Based $1 per Bracelet sold is donated to the Food Bank of New York. As we continue to participate at events throughout the tristate area, we have found that many people don’t know about the ‘evil eye.’ While everyone has heard people say something like, “she gave me the evil eye” or something similar, most people mistakenly think it is just another way of saying ‘dirty look.’ The reality is, the evil eye has a much longer and compelling history. Learning about the evil eye can be quite intriguing . To put it simply, the evil eye is an amulet, which is believed to ward off evil in many cultures. You might compare it to the ‘Hamsa,’ the ‘four leaf clover,’ or the ‘horse shoe,’ all of which are considered lucky charms of some sort here in America. With the evil eye, however, it is thought to be more than just good luck. The evil eye charm was created a very long time ago in order to prevent curses from taking effect. People believed that when someone gave them a malicious glare, it could cause bad luck and misfortune. In order to combat this bad luck, the evil eye was worn around the neck, on the wrist or even hung in the home. Whether you are a strong believer in the power of the evil eye, or you just like the way it looks, there is no denying that this symbol has been around for a very long time. Wearing one can be a fun and fashionable way to look great while possibly getting yourself a little extra luck at the same time. This weekend on Sunday June 7th 2015 #TeamMatimoo will be at the Israel on Nostrand Ave fair in Brooklyn, NY. Matimoo launches our first video clip giving a step by step tutorial on how to adjust and size your Matimoo evil eye bracelet to your preferred fit. You can easily adjust your Matimoo bracelet by sliding the knot across the string. One string remains stationary while the other slides across. We suggest giving each string a test pull in order to determine which string remains in place vs. which one slides back and forth. Currently Matimoo is offered in 7 vibrant color ways ranging from basic black to neon yellow. Matimoo is the perfect gift giving item at a retail price of $8.95 it’s a simplistic yet symbolic. You can follow us as we travel to events via Instagram @matimoocollections or via our weekly blog. Following these quick steps should make for an impeccable fit.